Myocarditis is an inflammatory disease of the myocardium with a wide spectrum of symptoms and severity. Fulminant myocarditis is a small cohort of this disease that tends to present with sudden onset acute heart failure, cardiogenic shock, or life-threatening arrhythmias. The most common type, and the one with the best likelihood for recovery, is lymphocytic myocarditis. More rare, and often more fatal, forms are eosinophilic myocarditis and giant cell myocarditis. Delayed recognition and lack of standardized therapy guidelines continue to challenge clinicians treating these critically ill patients. This article will review the most up-to-date literature regarding recognition and recommended treatment for fulminant myocarditis as it pertains to clinical practice. Myocarditis is an inflammatory disease of the myocardium. It has a wide spectrum of severity, with symptoms ranging from mild fevers, shortness of breath, and palpitations to severe hemodynamic collapse. Fulminant myocarditis is a rare form of severe myocarditis that presents with sudden-onset acute heart failure, cardiogenic shock, or life-threatening arrhythmias.1 Prognosis and management of this type of myocarditis varies based on endomyocardial biopsy histopathology, and is classified according to diagnostic criteria initially developed in 1986.2 The microscopic appearance of the myocardial inflammation forms the basis for this classification system.3 The most common microscopic type, and the one with the greatest likelihood of recovery, is lymphocytic myocarditis. More rare, and often more fatal, forms are giant cell myocarditis and eosinophilic myocarditis. 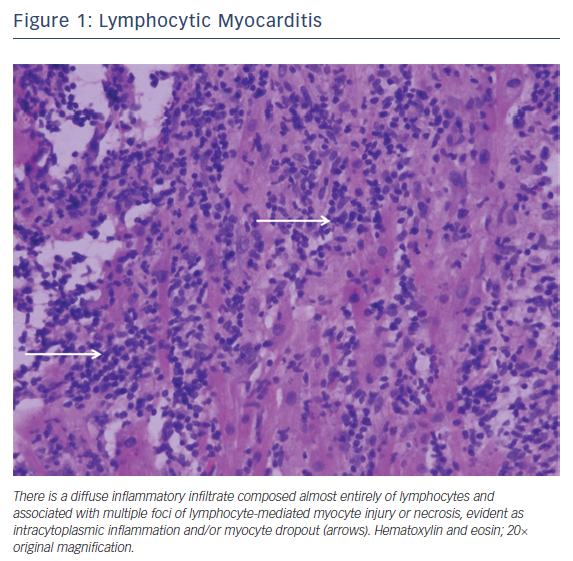 In this article, case examples of these three forms of adult fulminant myocarditis will be presented, as well as a review of the current literature on their causes and therapy recommendations. A 61-year-old woman with a history of Crohn’s disease presented with several days of palpitations and shortness of breath. ECG was noted for sinus tachycardia, low voltage, and frequent non-sustained ventricular tachycardia. Troponin T was elevated to 0.09 ng/ml. An echocardiogram showed severe biventricular failure and a left ventricular ejection fraction (LVEF) of 23 %. Angiography was noted for a 70 % mid-left anterior descending artery lesion. Right heart catheterization revealed cardiogenic shock and elevated filling pressures out of proportion for ischemic heart disease. The patient was initiated on inotropes for supportive care but continued to clinically deteriorate, with subsequent cardiac arrest from ventricular tachycardia. An endomyocardial biopsy was then obtained, which revealed fulminant lymphocytic myocarditis, and she was placed on extracorporeal membrane oxygenation (ECMO) support in the veno-arterial configuration. Further investigation did not identify any precipitant. She was treated with a slow steroid taper and several doses of intravenous gamma-globulin (IVIG) and plasmapheresis. Mechanical support was discontinued on day 30 after she experienced partial recovery. Unfortunately, she eventually expired from complications of her disease. As in the case above, the most widely employed therapy for lymphocytic myocarditis is glucocorticoid therapy. However, while a systematic Cochrane review found that steroid therapy may improve LVEF, the use of glucocorticoids in lymphocytic myocarditis has not been shown to reduce mortality.7 Similarly, the use of antiviral therapy, plasmapheresis or IVIG is not routinely recommended due to insufficient human data in the adult population.8,9 This recommendation differs from the pediatric population, in which there is some evidence for the use of IVIG in the treatment of lymphocytic myocarditis.10 This difference may reflect the wider variety of inflammatory etiologies seen in the pediatric population. A 70-year-old man without prior cardiac history presented with 3 days of progressive dyspnea, orthopnea, and fatigue. ECG showed a new trifascicular block and a Troponin I elevation of 23.78 ng/ml. An echocardiogram revealed a new global cardiomyopathy with an LVEF of 35–40 %. Shortly after admission, he experienced complete heart block, ventricular tachycardia, and sinus arrest. Urgent angiography showed non-obstructive coronary artery disease and right heart catheterization was consistent with biventricular heart failure and cardiogenic shock. 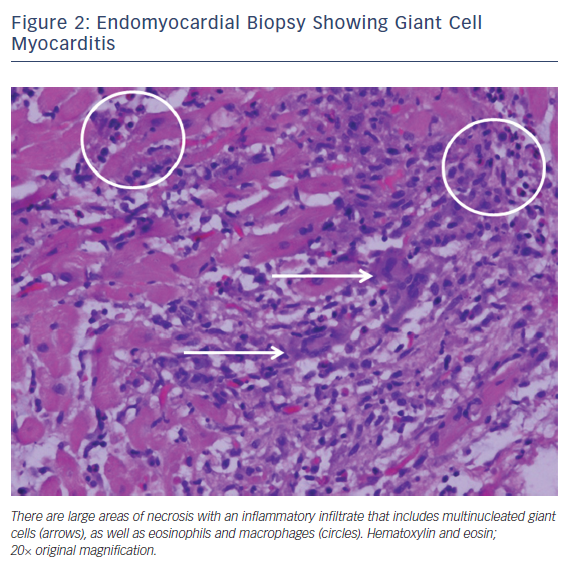 Endomyocardial biopsy demonstrated giant cell myocarditis. The patient was initiated on immunosuppressive therapy with steroids and thymoglobulin, and maintained on cyclosporine and mycophenolate. Once stabilized, he underwent implantable cardiac defibrillator (ICD) for secondary prevention. As an outpatient, he continued on standard heart failure medications, steroid taper, cyclosporine, and mycophenolate therapy. A 30-year-old healthy woman presented with several days of chest pain and fevers. An admission ECG was notable for pronounced anterior ST elevations (Figure 3). Troponin I was elevated to 10.77 ng/ml and her echocardiogram revealed a globally reduced LVEF of 25 %. She experienced sustained ventricular tachycardia with hemodynamic instability. Angiography revealed normal coronary arteries, and a right heart catheterization was consistent with biventricular failure and cardiogenic shock. She underwent emergent placement of ECMO in the veno-arterial configuration. Peripheral eosinophil count was 0 but endomyocardial biopsy demonstrated diffuse eosinophilic invasion of the myocardium, and a diagnosis of acute eosinophilic myocarditis was made. Further investigation did not identify any precipitant of her myocarditis. She was treated with a slow steroid taper. Mechanical support was able to be discontinued after 6 days, when an echocardiogram showed recovered biventricular function. As an outpatient, she continued on standard heart failure medications and steroid taper without recurrence of her heart failure. The differences between the three types of fulminant myocarditis are summarized in Table 1. Survival in fulminant myocarditis depends on timely identification and implementation of advanced circulatory support. Biventricular dysfunction remains the main predictor of death or need for transplantation.21,22 Endomyocardial biopsy is recommended for all patients (class I recommendation) presenting with fulminant heart failure of less than 2 weeks’ duration with hemodynamic compromise, new-onset heart failure of 2 weeks’ to 3 months’ duration with dilated cardiomyopathy, new ventricular arrhythmias, second- or third-degree heart block, or failure to respond to usual support care within 1–2 weeks.6,23. Endomyocardial biopsy can be considered for those with eosinophilia and recent-onset heart failure with potential allergic reaction (class IIa recommendation). Immunosuppression has a potential therapeutic role but requires further investigation before a standardized approach can be recommended. 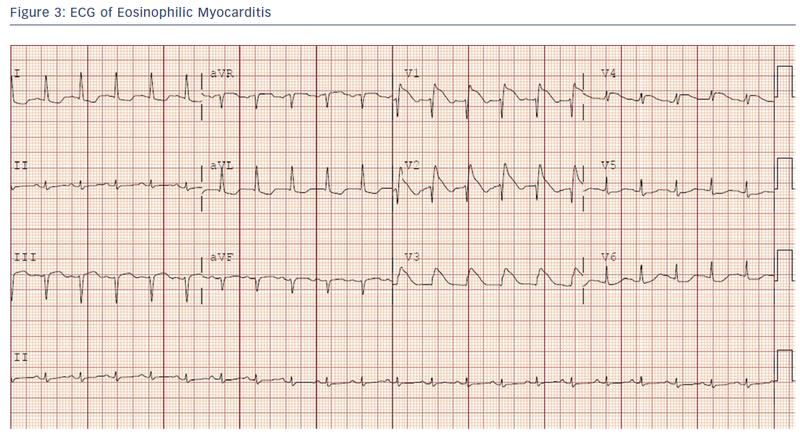 Clinicians should be suspicious for fulminant myocarditis in any patient presenting with new-onset malignant arrhythmias, conduction disease, or sudden cardiovascular collapse. Maisch B, Ruppert V, Pankuweit S. Management of fulminant myocarditis: a diagnosis in search of its etiology but with therapeutic options. Curr Heart Fail Rep 2014;11:166–77. Aretz HT, Billingham ME, Edwards WD, et al. Myocarditis. A histopathologic definition and classification. Am J Cardiovasc Pathol 1987;1:3–14. Biesbroek PS, Beek AM, Germans T, et al. Diagnosis of myocarditis: Current state and future perspectives. Int J Cardiol 2015;191:211–9. Hare JM, Baughman KL. Fulminant and acute lymphocytic myocarditis: the prognostic value of clinicopathological classification. Eur Heart J 2001;22:269–70. Friman G, Wesslén L, Fohlman J, et al. The epidemiology of infectious myocarditis, lymphocytic myocarditis and dilated cardiomyopathy. Eur Heart J 1995;16(Suppl O):36–41. Yancy CW, Jessup M, Bozkurt B, et al. 2013 ACCF/AHA guideline for the management of heart failure: executive summary: a report of the American College of Cardiology Foundation/American Heart Association Task Force on practice guidelines. Circulation 2013;128:1810–52. Schultz JC, Hilliard AA, Cooper LT Jr, Rihal CS. Diagnosis and treatment of viral myocarditis. Mayo Clin Proc 2009;84:1001–9. Robinson J, Hartling L, Vandermeer B, Klassen TP. Intravenous immunoglobulin for presumed viral myocarditis in children and adults. Cochrane Database Syst Rev 2015;5:CD004370. Jones SR, Herskowitz A, Hutchins GM, Baughman KL. Effects of immunosuppressive therapy in biopsy-proved myocarditis and borderline myocarditis on left ventricular function. Am J Cardiol 1991;68:370–6. Khan T, Selvakumar D2, Trivedi S, et al. The value of endomyocardial biopsy in diagnosis and guiding therapy. Pathology 2017;49:750–6. Kalra A, Kneeland R, Samara MA, Cooper LT Jr. The changing role for endomyocardial biopsy in the diagnosis of giant-cell myocarditis. Cardiol Ther 2014;3:53–9. Kandolin R, Lehtonen J, Salmenkivi K, et al. Diagnosis, treatment, and outcome of giant-cell myocarditis in the era of combined immunosuppression. Circ Heart Fail 2013;6:15–22. Cooper LT Jr, Berry GJ, Shabetai R. Idiopathic giant-cell myocarditis – natural history and treatment. Multicenter Giant Cell Myocarditis Study Group Investigators. N Engl J Med 1997;336:1860–6. Al-Khatib SM, Stevenson WG, Ackerman MJ, et al. 2017 AHA/ACC/HRS guideline for management of patients with ventricular arrhythmias and the prevention of sudden cardiac death: a report of the American College of Cardiology/American Heart Association Task Force on Clinical Practice Guidelines and the Heart Rhythm Society. J Am Coll Cardiol 2017;; epub ahead of press. Enriquez A, Castro P, Gabrielli L, et al. Acute necrotizing eosinophilic myocarditis presenting as ST-elevation myocardial infarction: a case report. Can J Cardiol 2011;27:870.e1–3. Brambatti M, Matassini MV, Adler ED, et al. Eosinophilic myocarditis: characteristics, treatment, and outcomes. J Am Coll Cardiol 2017;70:2363–75. Rizkallah J, Desautels A, Malik A, et al. 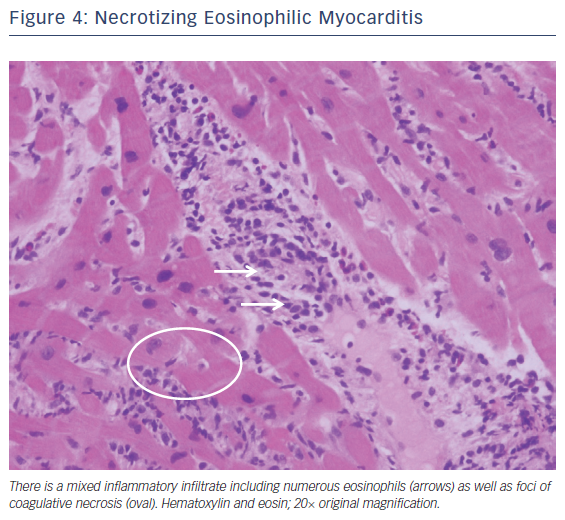 Eosinophilic myocarditis: two case reports and review of the literature. BMC Res Notes 2013;6:538. Al Ali AM, Straatman LP, Allard MF, Ignaszewski AP. Eosinophilic myocarditis: case series and review of literature. Can J Cardiol 2006;22:1233–7. Caforio AL, Calabrese F, Angelini A, et al. A prospective study of biopsy-proven myocarditis: prognostic relevance of clinical and aetiopathogenetic features at diagnosis. Eur Heart J 2007;28:1326–33. Ammirati E, Cipriani M, Lilliu M, et al. Survival and left ventricular function changes in fulminant versus nonfulminant acute myocarditis. Circulation 2017;136:529–45. Cooper LT, Baughman KL, Feldman AM, et al. The role of endomyocardial biopsy in the management of cardiovascular disease: a scientific statement from the American Heart Association, the American College of Cardiology, and the European Society of Cardiology. Endorsed by the Heart Failure Society of America and the Heart Failure Association of the European Society of Cardiology. J Am Coll Cardiol 2007;50:1914–31.